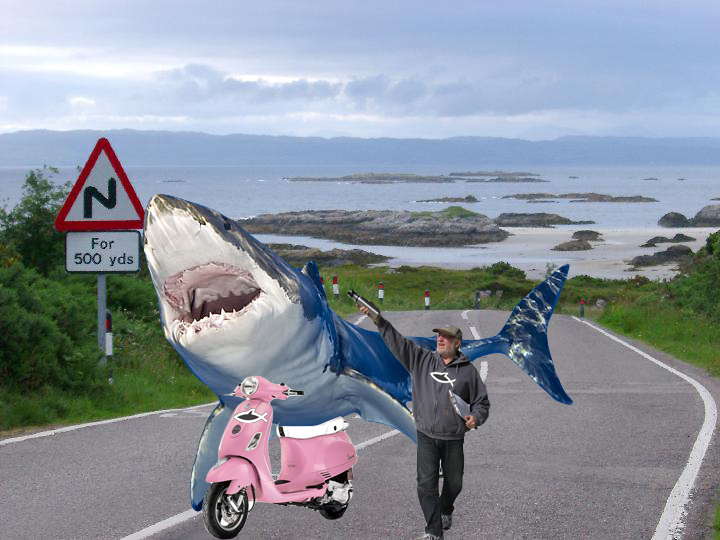 (PORTLAND, OREGON) Stung by the success of endurance swimmer Diana Nyad’s arduous passage from Cuba to Florida, a shark is attempting an overland cross-country marathon aided only by a Vespa scooter. The great white shark, unnamed because it’s a shark, left the Columbia River near Astoria, Oregon on Thursday and has been traveling rural roads en route to Interstate 5 through Portland, then will head east for 3,107 miles. If all goes as planned, the fish will return to the Atlantic Ocean off Rockland, Maine after devouring the townspeople. This is the shark’s fourth attempt at conquering the grueling continental crossing. The first two failed because of unanticipated highway tolls. On its third try the plucky great white made it as far as Davenport, Iowa but was forced to turn back after slaughtering an orphanage full of children. While Nyad had to contend with the danger of treacherous currents, unpredictable squalls and stinging jellyfish, the shark’s primary concern is lack of water, now that Roy Scheider is dead. “Dehydration is expected. The shark replenishes from a sports bottle I carry. Mostly Gatorade, electrolytes, some krill,” Ferguson explained. Besting Nyad and, with any luck, finding and eating her is no doubt foremost in this determined predator’s mind – or rather the sensory processing hindbrain that serves as its mind. But more important is the courageous shark’s inspiring message of perseverance and personal sacrifice – a valuable sports lesson in the wake of the doping scandal that cost so many Chilean sea bass Olympic gold in Beijing.